By supporting Puzzle Centre you can help change the lives of children with autism and other communication difficulties. Every penny counts and makes a vital contribution towards our provision of specialist education, therapy and support. We work with children aged between 2 and 11 years of age; all of whom find it difficult to communicate, interact with others, manage their emotions and engage with the world around them. Together, we can help them to develop vital communication, social and emotional skills in their early years, which can transform their futures. We can provide parents with information and guidance, as well as practical and emotional support. 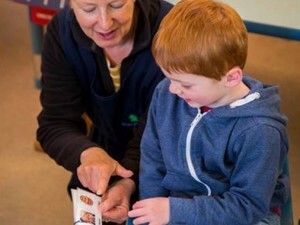 We can also provide training opportunities for professionals to help build their knowledge and skills in the provision of specialist support for children with autism. As a charity, Puzzle Centre needs to raise at least £250,000 each year through grants, donations and fundraising activities. We are very grateful for the generous support of many charitable Trusts, companies, community groups, sports clubs, schools and individuals, which makes such a difference to what we can achieve for children with autism and, consequently, what they can achieve for themselves. 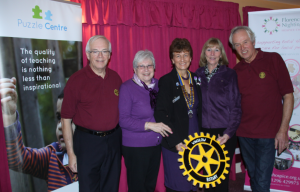 Puzzle Centre is very grateful to Winslow Rotary’s “Polio Immunisation Project Home and away”. Not only will the team be visiting India to help immunise hundreds of children against Polio, but they are also raising funds for children’s charities closer to home. Puzzle Centre is delighted to be one of their chosen charities to benefit from this amazing project. Thank you. Thank you to Winslow in Bloom 2017 for their wonderful donation of £500! Go Givers – Make a difference challenge project. We are so grateful to the school council for choosing Puzzle Centre. The Quainton Community Choir raised an amazing £208 for Puzzle Centre at their first ever concert – thank you! Thank you to Mursley Players, who made a fantastic donation of £468 to Puzzle Centre following their Variety Show. Puzzle mum and member of staff, Hayley, raised over £2,500 by running the Virgin Money London Marathon in April 2017. What an incredible achievement! Winslow Rotary have supported Puzzle Centre with a grant of £2,000 towards Attention Autism training for our staff who work with the children in our specialist nursery and through the Puzzle Assessment and Support Service (PASS). We are so grateful for their support. April was autism awareness month, and Puzzle Centre had a stall at the Winslow Easter Fayre. Thank you to everyone who donated home-made items for the stall.